This was our first week of home school preschool/tot school. And I must say it went really well. Kirby and I have been going through a major adjustment phase in our relationship, since adding baby Jack to the mix, we have really just been in survival mode up until now & are just starting to get back into our regular fun filled schedule. We went from having something going on daily, to being trapped at home with a newborn in the middle of summer, to going back to school (which really jacked up everyone's routine) and finally bringing it all back home. Best decision yet. Kirby really thrives with one-on-one attention & that has been something that we have lacked between the two of us the past 4 months. Having a set schedule and activities prepped ahead of time (that is the key to all of this) so all we had to do is grab from our daily box of activities & get to playing has made our days so much more enjoyable. Teaching has always been a passion of mine, so setting up & researching activities for her and I to do together has been almost therapeutic for me & in return for my relationship with Kirby. Brian described it best, it's like she is getting her mom back. Not that I had gone anywhere, but my focus had been so heavily on Jack, we just hadn't really gotten back to being "us" again. Four months has definitely been a sweet spot for all of us. So here is how our first week went, our theme this week was colors. (I didn't grab pictures of these yet, so I will include some in next week's update). We have two posters (Months of the Year & Days of the Week) and a princess calendar that she picked out that we work with during this time. - First we sing along to our days of the week song that we like. We found this one on YouTube and it has actions to go along with the song that she really likes and helps her to remember the days. She then moves the clothespin to what today is. - Next we repeat what month we are in & talk about any special things that are coming up this month (weather changes, holidays, birthdays and any other exciting things we may have planned). And I sing the Months of the Year song to her that I learned a long time ago in music class when I was a kid, she loves it & asks me to repeat it about 3 times each day (I can tell she is really trying to memorize it). 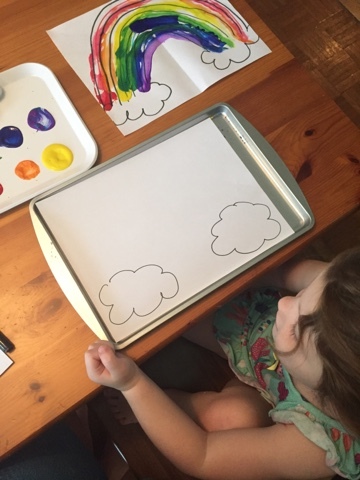 -To finish off calendar time we talk about what the weather is like today (I an going to make her a weather chart this week to use) and place a sticker on whatever today is and say the date out loud together. Kirby grasps concepts very quickly, but writing and using scissors pose as the most difficult tasks for her at the moment, so we are sure to practice those as frequently as possible. 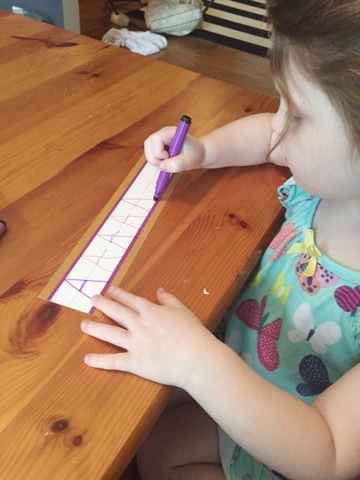 Each day I write in pencil on her little lined strips of paper, (not sure what they are called) that I found at the dollar store, her name and the letter of the week. She traces those and then we go over our sight word of the week. This week I forgot to introduce the sight word, but our letter was A. So I initially had a super strict schedule mapped out with specific activities and subjects according to the day of the week, but it turns out that it works better for us if we just try and hit one subject per day (Math, Science, Reading, Writing, Social Studies & Science) & 2-3 play based learning activities additionally throughout the day. Some days we run errands or have play dates/outings so our days get cut short & we may not get to every activity. But she is only three, so we do the best we can & make sure that we are focusing on enjoying our learning experience rather than being forced to follow a strict schedule. Oh, and all of my supplies were purchased from the Dollar Store. 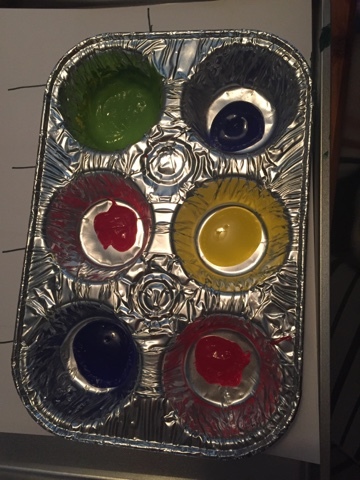 First thing that morning we made bath paint (we just sprayed some shaving cream into a muffin tin & added food coloring). 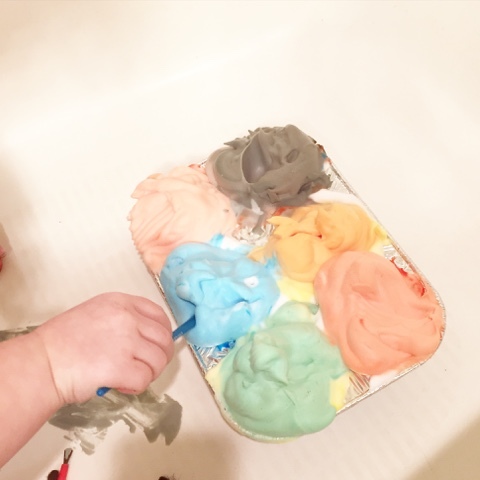 We talked about which colors mixed together to make which colors & then once we stirred up our paint she went to town in the bath tub. She probably played in the paint for a good 45 minutes and then I put in something of her horses to paint (per her request) and it turned into bath time for another hour or so! 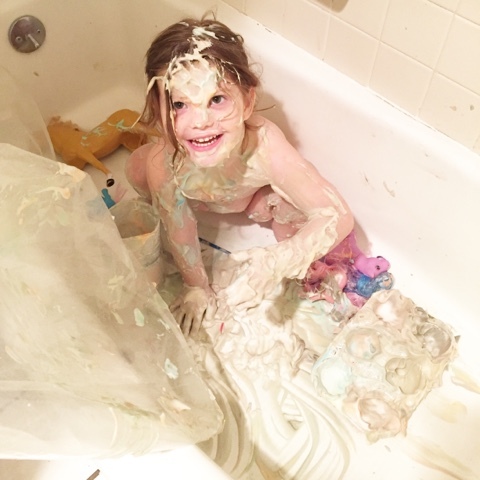 Bonus, bath time is done for the day & you now have a clean toddler and bath tub after you wipe everything down. Clean up was super easy by the way, I was a little worried if the food coloring would be hard to get off of skin and a white bathroom. Wiped right off. 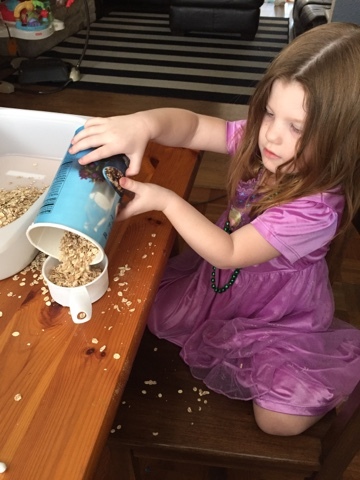 Next we did her most favorite activity of the week, I think, the Wild Berry Pie sensory bin. This one had nothing to do with colors, it was supposed to be for textures week, but I mentioned it to her and she really wanted to do it, so we just went with it. 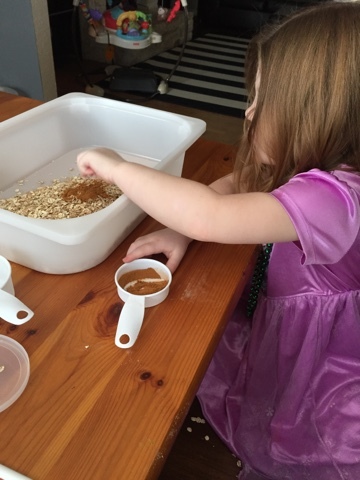 - First we measured out 4 cups of oats & poured them into the bin, next we added a few tablespoons of cinnamon so she could "smell the pie". - After we stirred that all up we started counting out the different kinds of berries we had (blackberry, blueberry, raspberry & grapes) and added them into the pie. We also tossed in some white pom poms as marshmallows. 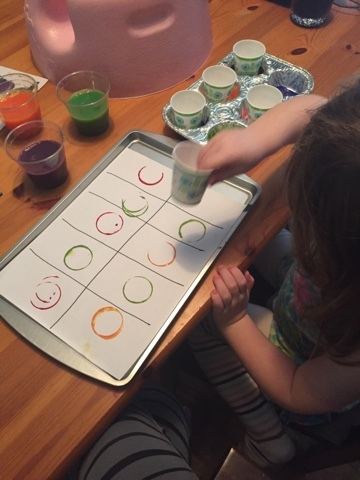 - Next we used this time to make patterns out of the different berries, and talk about the different textures. 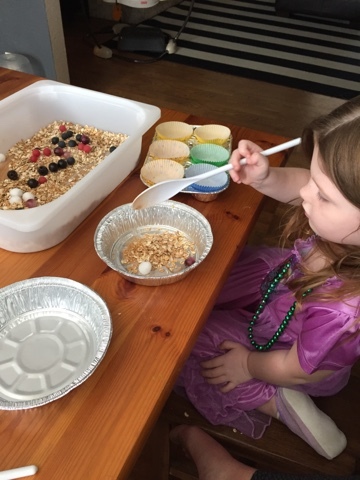 The oats were rough, the berries were smooth and the marshmallows were soft. 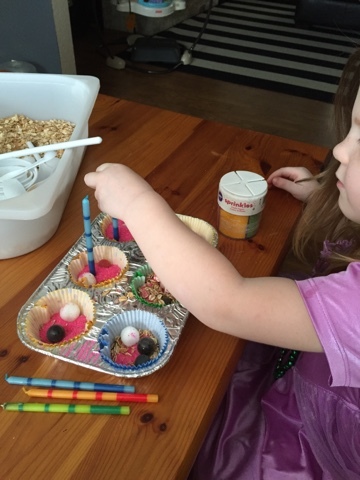 - From there, we dished out the pie mixture into our pie & cupcake tins. 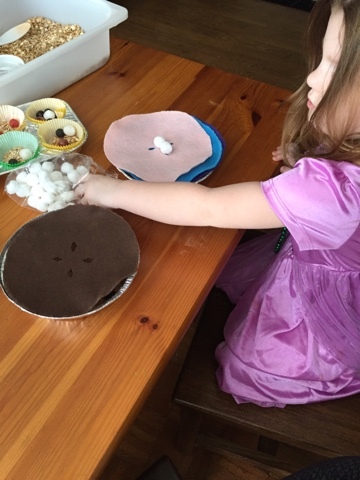 Then we walked over to her play kitchen and placed our pies & cupcakes into the oven and set a timer. - While they were cooking, we rolled out our pie dough. Once the timer went off we checked our goodies and smelled them, they came out perfect. So we topped the pies with their crust and some marshmallows & added sprinkles and candles to our cupcakes. - From there she decided she wanted to feed her babies and I just let her go into free play the rest of the time. 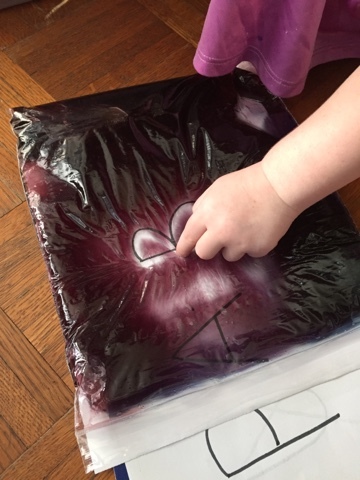 Next we made a gel trace bag (just filled a gallon zip-lock with clear hair gel, added food coloring and zipped it back up) and practiced tracing our letters. 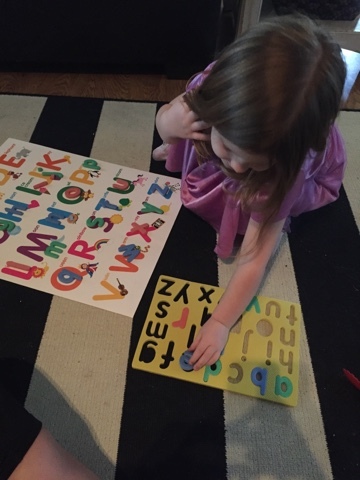 She was over this super quick (she didn't even want to finish the alphabet) so we haven't used it since, but it was a cool concept I thought. 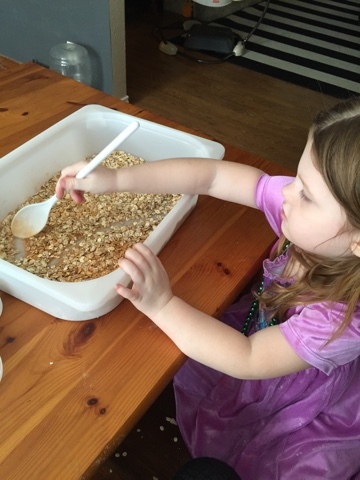 First we did a lower case sensory bin. I got a foam puzzle with lower case letters from the dollar store & placed them into a small box of black aquarium rocks. I then got three clear cups & put colored construction paper at the bottom of them coordinating with the color of the letters. 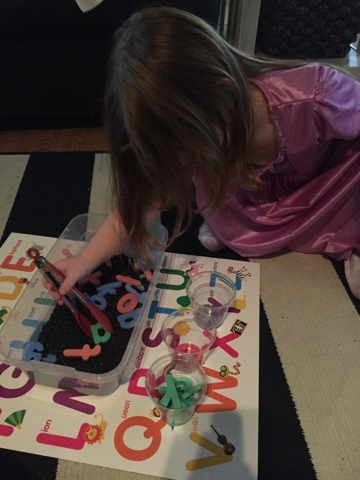 She first used tongs to sort the letters into the correct colored cup (fine motor skills). From there we matched the "baby letters" to their "mommy letters" while repeating what sound that letter made until we found its mommy. Finally, she took the baby letters (repeated their sound again) and placed them into the puzzle their homes, just for one last reinforcement of that concept. 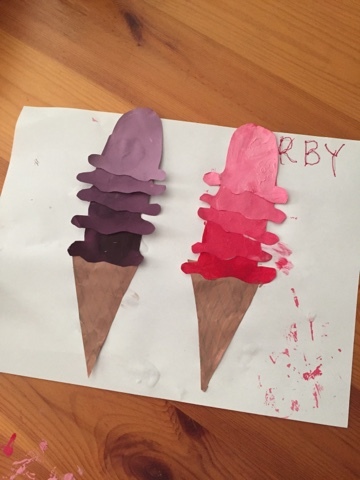 Next we made ice creams cones & arranged them according their shades of color. I had everything pre-cut & we started with her color of choice (we did purple & red) and then continued to add white "to make the color light" until we filled 5 scoops. 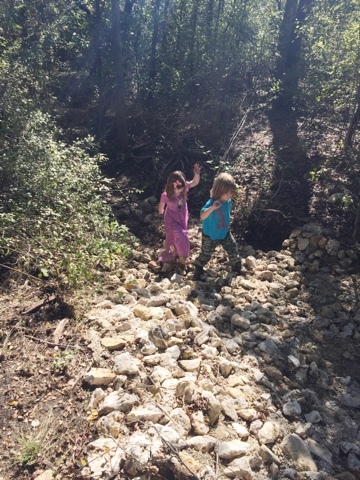 We let them dry while we went on a hike with friends for a picnic lunch that afternoon. 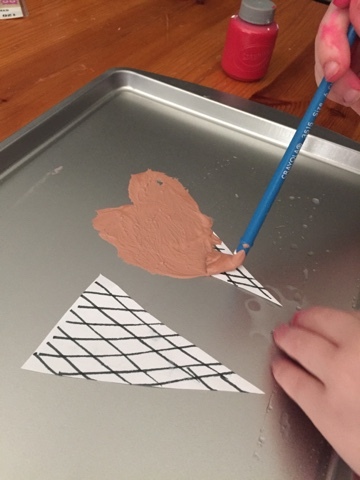 When they were dry, she arranged them from lightest to darkest & glued them onto the ice cream cone (which she painted & tinted light brown as well). I will tell you she strongly grasped the concept that white tints colors lighter and talked about it all week. She really loved this activity as well. We had a play date & lunch at our friends house and when we got home we just made play dough together while baby Jack napped. 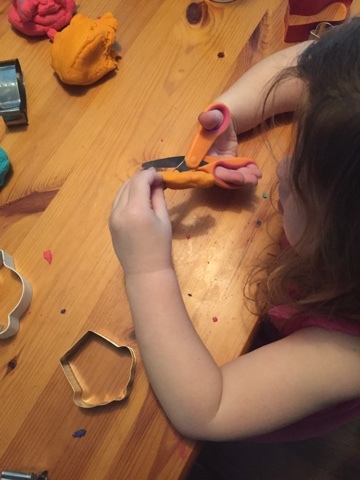 We worked on a little bit of fine motor skills by rolling out the play dough and cutting it into smaller pieces. 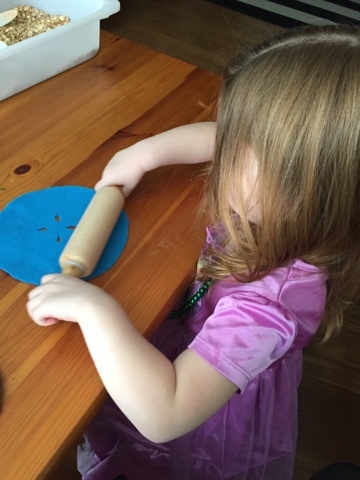 But it mostly just turned into "baking cookies" and free play with cookie cutters and the rolling pin. 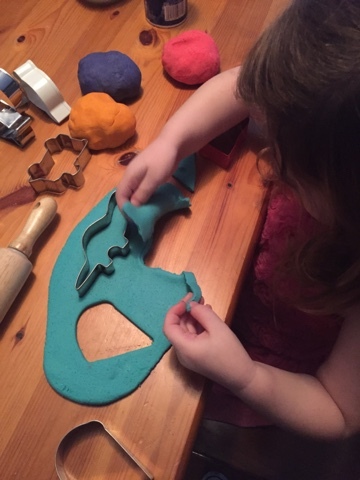 AKA I rolled out a bunch of play dough and she stamped it with cookie cutters for 30 minutes haha. 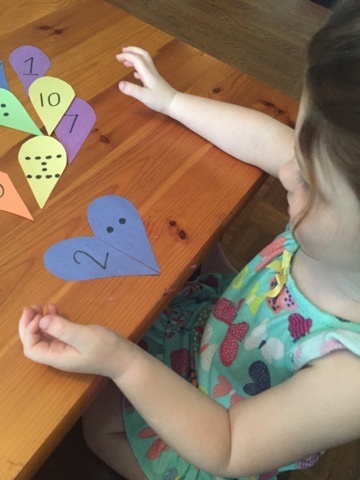 I made these colorful math hearts and she counted and matched them together. 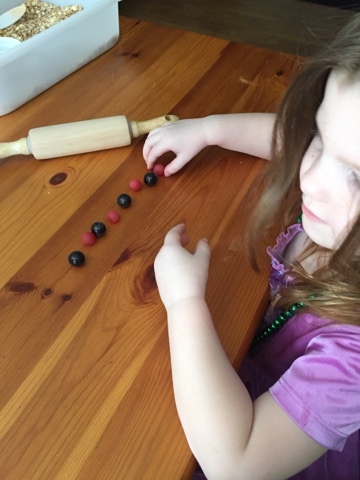 Kirby has mastered the concept of counting, but a lot of times moves her fingers too fast and gets ahead of herself, so counting these small black dots was great practice on slow and precise counting. 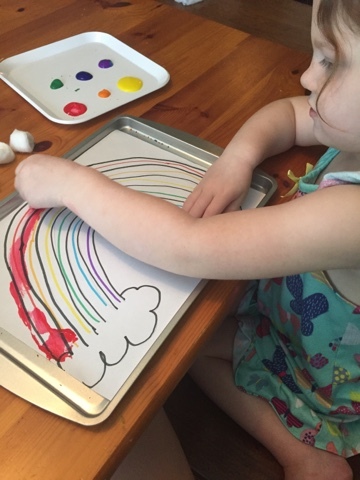 Then we practiced the order of the colors in the rainbow (I asked her what color was first, she would say red, find the red, dip the cotton ball, then orange, etc.). 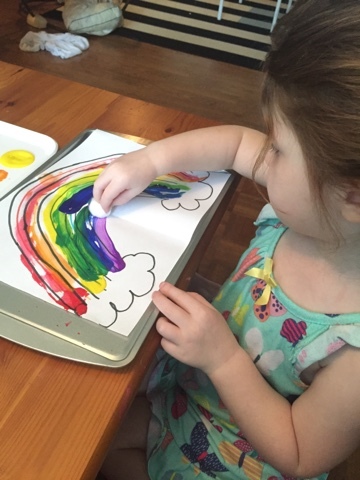 Next I gave her a blank sheet with only clouds and had her draw the colored arches her self and see if she could remember the colors in order. 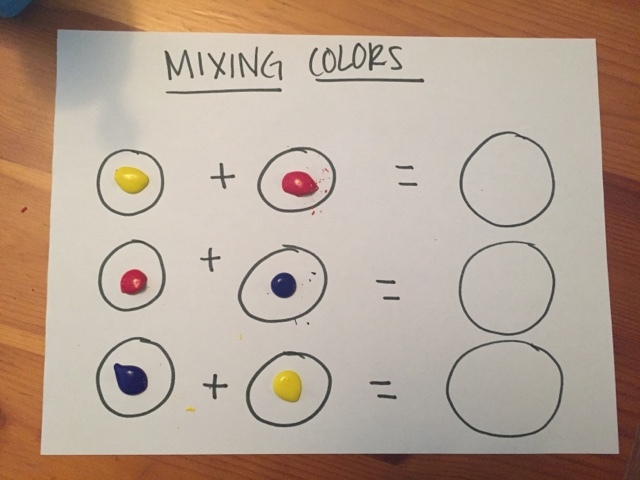 We did a little bit of science while reinforcing the concept we had been working on of mixing colors. 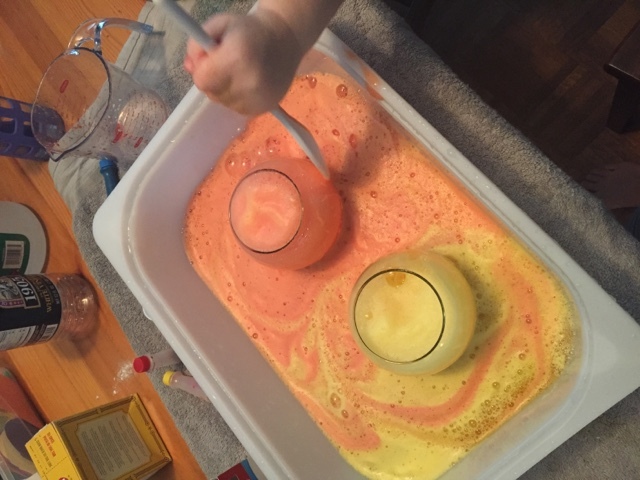 I filled two jars with baking soda & dish soap (to make the "explosion" extra bubbly). 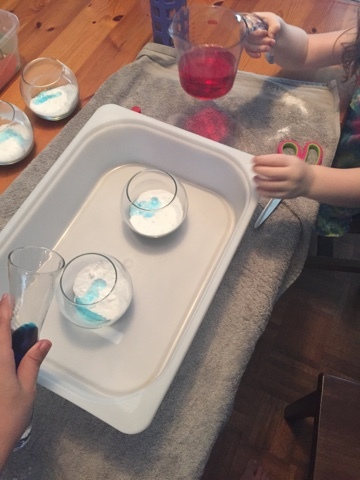 Then I filled two other containers of vinegar and food coloring & we would pour them into the jars at the same time & the colors would bubble out and mix together. 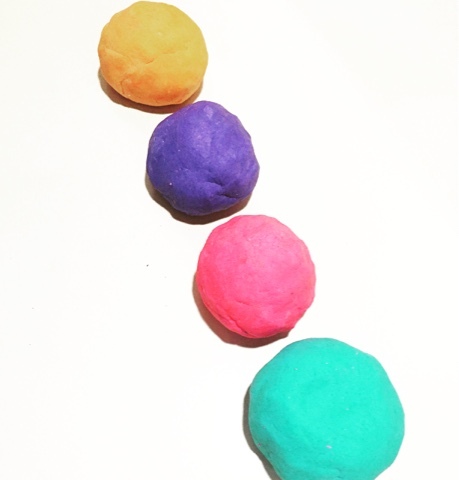 She would then stir the overflow mixture at the bottom of the tub together and see what color it tuned into. 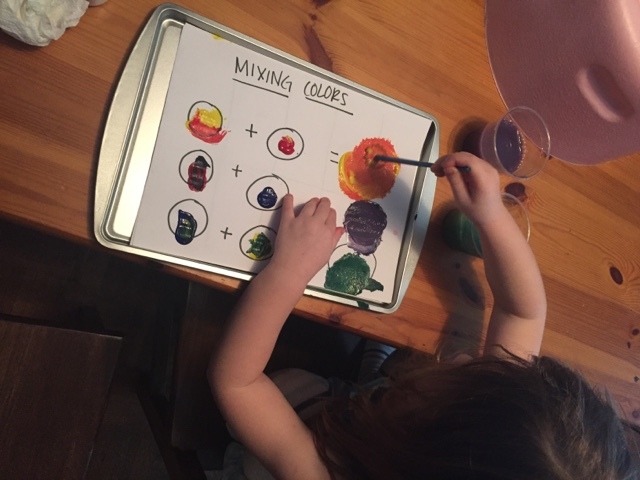 This really was a fun way to reinforce the mixing colors concept (which we are very impressed that she fully knows how to make purple, orange and green now). Then on the last one I just let her free play in the colorful foam. Next I pre set up this mixing color sheet and just once again reinforced the topic that we were covering this week since it was our last day. 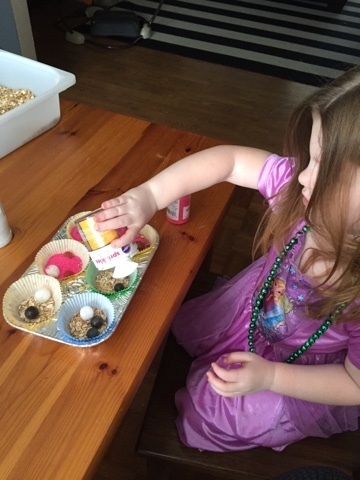 And finally one more reinforcement activity, I had her mix the colors in the muffin tins & then dip in some dixie cups and stamp patterns out of her choice of colors. Overall we had a great week & we were really impressed to see her grasp the concepts so quickly. We covered math, writing & science this week coordinating with our topic of colors, but didn't get to a reading activity or social studies, so we will be sure and hit those next week. 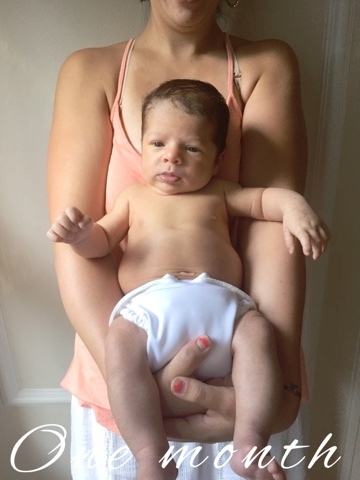 Diaper Size/Clothing Size - We started using cloth at 4 weeks, and he started blowing out of newborn disposables at about 3 weeks. We now have a small package of size one disposables on hand. He grew out of NB clothes at about 3 weeks as well & is sitting right at 0-3 and some three months sleepers etc. since his cloth diaper booty makes things fit just a little more snug, but I always tend to buy bigger with my babies since they grow out of things so fast. Feeding- We nurse on demand, every 2 hours or less. He also comfort nurses & we are trying to get him to take a paci when needed & plan to try a bottle of pumped breastmilk this week. I will share my nursing journey with Jack, here. 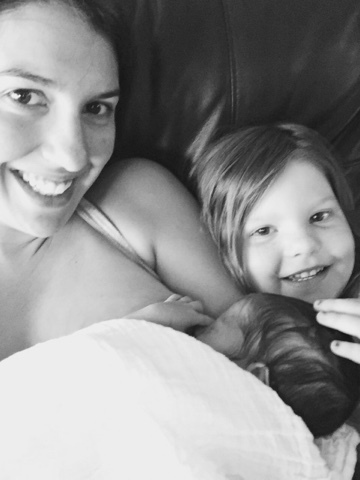 For now you can read my more complicated nursing journey with Kirby here. Sleeping - Sleeping more than two hours at a time isn't really his thing at the moment. 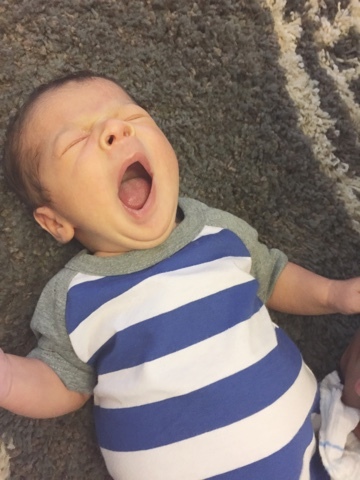 He co-sleeps with us currently & will make the slow transition to his pack and play or bassinet or rock and play (whichever he prefers) at around 12 weeks like his sister did. Favorite Toys- Not there yet, he is just now staying awake for more than 5 minutes at a time. And by more than 5 minutes at a time I mean 10 minutes of awake time. He is a sleepy guy! Loves- He loves his people, he recognizes of course my voice and scent, but he knows Kirby's & Brian's as well. 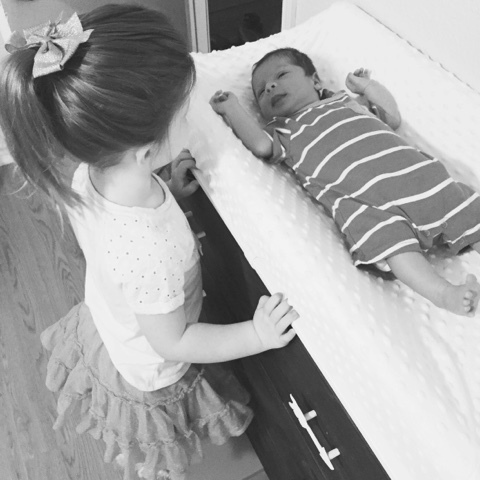 He will calm right down when his daddy rocks him a special way & loves when his sissy talks to him while I am changing him, it really keeps him calm during diaper changes, I am always asking Kirby to talk to him when I need a second to do something. He loves taking baths with me as well, if he is being especially fussy I just run the bath and relax with him in it and he chills right out (this is usually during his evening hours when Kirby is asleep or sometimes during her nap & we have all three taken a bath once haha). He definitely feels most at home in the water. And do I even need to mention boobies? He loves boobies. Not so much- Not a fan of being put down...ever. Besides in his swing (he loves his swing) and he is actually pretty good about sleeping in his car seat when we are on the go. Thank goodness because his sissy couldn't stand hers. Nicknames - I am sure he will get some funny ones later on, but for now he is baby Jack, big boy & bubba. Signature moves- Let's just say the boy is a great pooper. More than once he has projectile pooped into my lap (while I was changing his diaper) and he loves to poop multiple times during a diaper change & occasionally pee all over me and his own face (true story). Milestones- He has amazing head control, his sister definitely didn't have as much head control as he does this young, so it really surprises us. He smiles at the sounds of our voices & he made an accidental coo last night (6/23/15). Adventures - Really no big destinations this month, grocery store, Kirby's gymnastics & tagging along on play dates & out to dinner twice is as far as he has gone. Everyone told me that my heart would grow, that it would love this baby boy just as much as my girl. But my heart was so full of love for my sweetest side kick and best friend that I couldn't imagine loving another soul as much as I love her. How could I? No one knows me like she does, no one spends every second of every day with me & loves me unconditionally. No one could possibly take that place. I cried on the way to the hospital (Jack's birth was a surprise early birth at 37 weeks, will be posting my birth story here soon) how could this be my last day with my girl? This would be the last day of just her & I, but I wasn't ready, it wasn't supposed to be today, I needed one more day to spend and hold and savor every sweet ounce of my girl, just me & her. 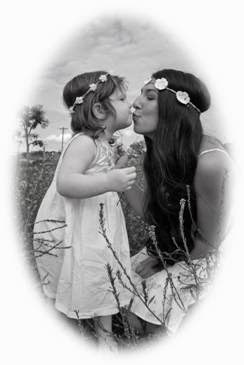 Then he was born, they placed him into my arms & he awakened a piece of my spirit that I never knew existed. My heart split wide open and I fell in love with this little boy just the way I did my girl. In this life we have soul mates that's for sure, and God has engraved three perfect soul mates so deep into my heart and soul they could never be removed. I never knew I could love so much, and I never knew happiness like this could be so beautiful & painful in the same moment. It's true, love does not divide it only grows. How far along? 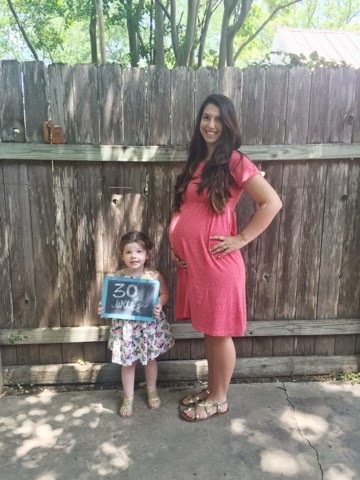 - 30 weeks! I have been waiting for this marker to arrive! We are in the home stretch! Weight Gain - 33lbs, I am off and on with consistent working out. Some weeks I do really well and others not so much. Twenty minutes on the Stairmaster in the evenings has been my favorite exercise lately. Maternity Clothes - This shouldn't even be a question anymore. Trying to avoid buying anything else until after Jack, so just repeating a lot of the same things for now. Sleep- Still the same really, just waking up to use the restroom throughout the night and having trouble falling asleep. 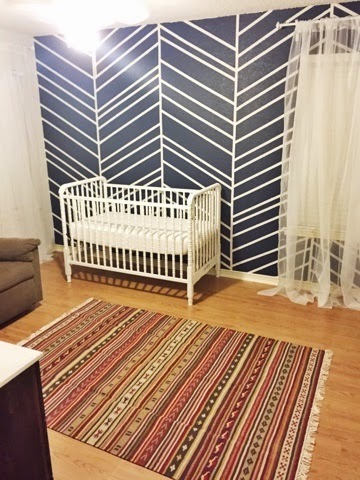 Best moment - Other than passing my glucose test, we have made some nursery progress and I am in love! I will be posting a tutorial on how I did the wall very soon, its been in my drafts half completed for a while now! But I still have quite a bit of small details before we do the full reveal. Here is where we are at so far! Worst moment - Hmm, these are always hard for me. I try and cherish everything right now. I would say other than the general overwhelming feeling of getting everything ready in the next 6 weeks things have been great. In case I develop cholestasis again I need to be ready to deliver at 36 weeks, it's sort of a surprise thing. I didn't show signs until 34 weeks with Kirby and then I was told I was having her 2 weeks later when I thought I still had 6 weeks to prepare, so I just want to be ready this time. Miss anything? - I really miss running and my intense workouts. I remember feeling this way towards the end of my pregnancy with Kirby as well. I started 10lbs heavier than I was with Kirby this pregnancy, so I have already racked up 40+ pounds I need to loose. I am definitely ready to get my body back, summer time always makes you more aware of those extra pounds. 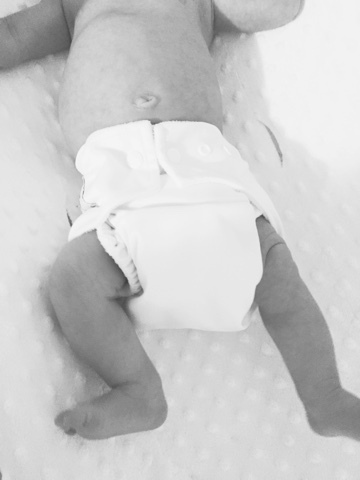 Movement - He still moves constantly, even though my placenta is anterior I have now been able to distinguish certain body parts when they are on the sides, i.e his feet in my ribs constantly! He also does this funny thing where it feels like he is tickling me or something, I will be curious to see what exactly it is that he is doing when he gets here. Cravings - I have been all about the fruit lately. Strawberries, pineapple, watermelon and apples have been filling up our fridge this month. Looking forward to - My big girl turns 3 in the next few weeks and I am looking forward to her party and giving her her special gift that we ordered yesterday! I will share more about her party plans and gifts in another post, she is so excited about it! With the addition of baby Jack in the next 13 weeks we have transitioned Kirby from a big girl room and a playroom to a combination of both (we actually re-did this room right after Christmas, but I am finally getting around to sharing it). 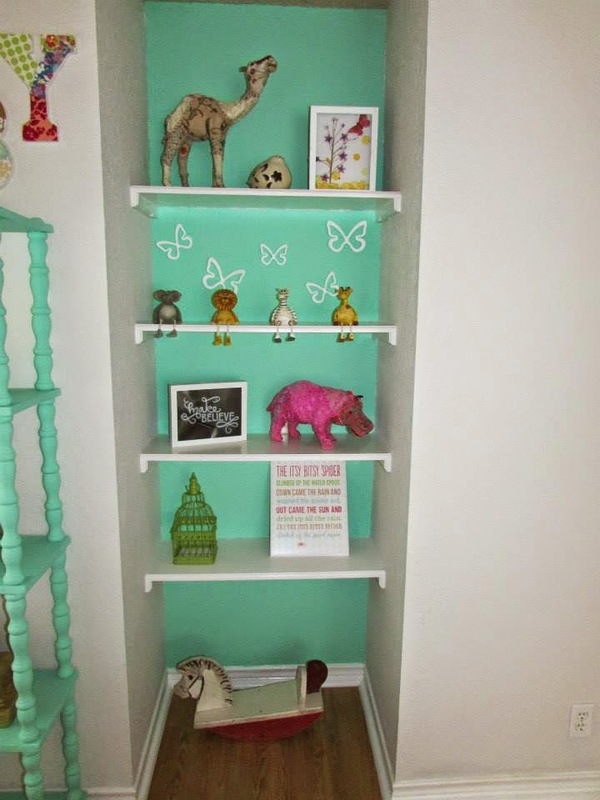 I have been wanting to share how we organized and fit everything into her room without there being a ton of clutter and still keeping the decor we had up originally. I had to let go of the perfectly put together bedroom that we had originally set up, but honestly that was my vision not hers. She LOVES her room with all of her things in it & she loves the extendable toddler bed much much better than the tall big girl like bed I had originally placed in there. I think having everything in one room gives her a sense of ownership & pride over her own space, and it stays so much more organized than her playroom. We made sure that everything has a place and nothing is just shoved into buckets filled of random things. This way she plays with everything that she has (since she can find it all now) and she knows where everything goes so she actually enjoys helping me clean up her room each night before she goes to bed. I will post the pictures of her original big girl room first and then I will break down her new room with organizational details! 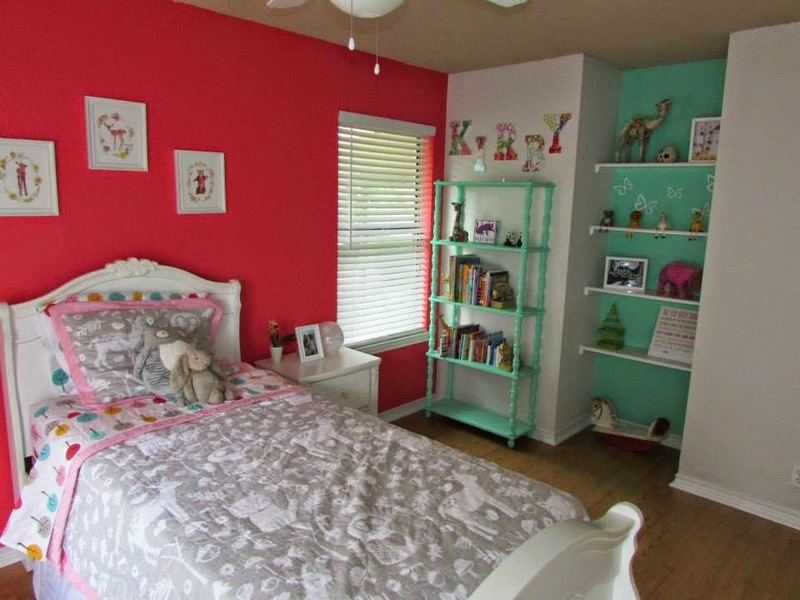 This bedroom is actually the first bedroom that we ever decorated of Kirby's. She never had a nursery all put together because we literally moved 10 times in the first two years of her life. Now that we are here to stay I was so happy to be able to create a special space for her. I know that she will never remember or care about not having a nursery that was carefully prepped for her arrival, but it was something I always wanted to give her, so a lot of time & love was put into this big girl room of hers. Now for the remodel, which just fits Kirby's personality to a T. I was so worried that this room would turn into a cluttered mess once we combined all of her toys and such, but it really worked at perfectly. Ikea was my go to for all of the organizational pieces, and well, most everything else in her room. The book shelf shown above was a Goodwill find that I painted myself and the bed above was a Craigslist find. Everything else I will address below each image. I will start with the closet, this was right before her Spring/Summer wardrobe and a couple pairs of new shoes that she just got hooked up with, so I promise she has more than 5 dresses and 20 long sleeves. I am not a shopper at all, so I tend to buy her a bunch of stuff at the start of each season and then by the end of that season it starts dwindling down to what is left that will fit her or isn't completely stained until its time to shop for the new season. Shoot you should see my own closet, I own about 3 pairs of shoes and probably less clothing than this. Anyways, totally off topic, I wanted to share the storage drawers that we put in there from Ikea. This is where the bulk of Kirby's toys are stored. She is a very imaginative player, much like myself when I was little. She loves little plastic figurines of different characters and animals. Those are hands down her favorite things to play with. They are all coordinated in each drawer, just for fun I will go ahead and label what is in each drawer from the top left down. Can you imagine having these kinds of toys without those bins??? They ended up in a big bucket and she could never find all of the characters. Surprisingly we keep them together very well now & she knows exactly where they go when it is time to clean up in the evenings. Kirby is very particular about her things and having them in the right spot (she gets that from her daddy), so I think she enjoys having these bins as well. This little storage bin unit is also from Ikea and this stores a lot of her larger toys that she plays with. I love the staggered look so it doesn't take up too much space on the wall and allows for more surface area for things to be stored on the top as well. I will list what's inside the bins as well from top left down. 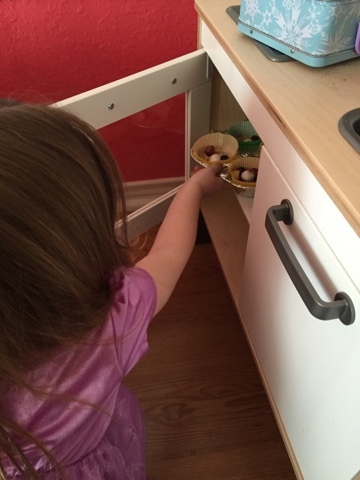 -Horses, she has a lot of little horse figurines that she loves that didn't fit in the smaller bins. In the Mason jars are actually different magnets (animals, fruits, vegetables, letters & numbers). These will slowly make their way into Jack's room and I will probably replace them with art supplies. We actually taught Kirby her animals super early using these magnets. She was not even two yet and she could go to the refrigerator and get animals like rhinoceros, gorilla, ostrich and all of this crazy stuff, all because of these magnets. 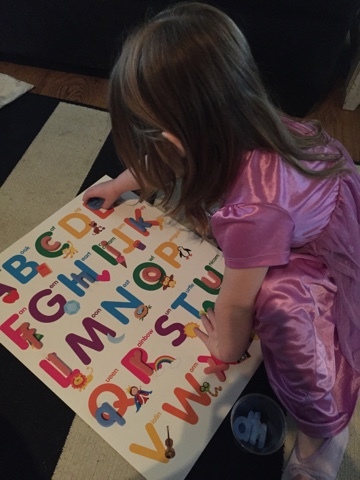 They really are a great learning tool & she is still working on letter and number recognition so we use those quite a bit still. The big horse you see is Ricky Bobby, and one of the mason jars are filled with all of his accessories. My dad owns an equine rehabilitation facility and one of their horses is named Ricky Bobby & she loves visiting him, so my dad got her this as a gift and of course she named him after her beloved Ricky Bobby. 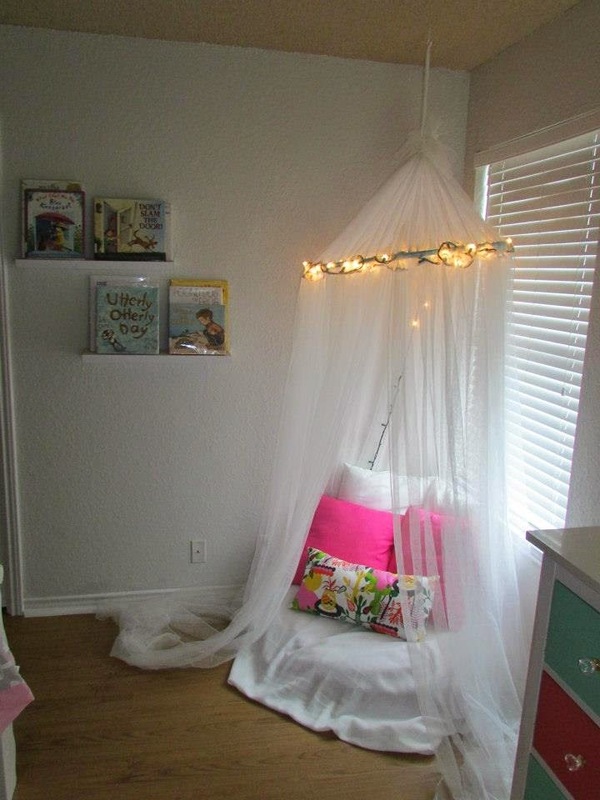 This is her reading nook that still needs some work and some curtains, right now it's not really functional as a family reading nook. We read 2-3 books before bed and nap each day/night. I am really wanting to make some type of large comfy bed like thing with a lot of pillows that we can all sit on comfortably and read books. When Jack gets here there will be four of us & we plan to all read books together each night in her nook and then put Jack to bed in his room and Kirby in hers. I made her a nap mat for Mother's Day Out (I'll post a quick tutorial soon) out of a foam mattress topper and a body pillow cover, so I am thinking of making a larger version of that for the base and adding comfy pillows and throws for the rest. I am open to suggestions! The shelves we use for library books, she went through a phase where she would tear pages out of books (thankfully over it now). So we made this the designated area for library books, we get new books each week and she knows that we have to take special care of these books and they are not allowed in her bed at night (she chooses a few books to read in bed to her stuffed animals before she falls asleep). This is her dresser and to the right is where she stores her baby doll strollers and her little baby doll bed (that is not pictured). I got this dresser from Ikea on clearance, it was completely black. I painted the drawers and sides to match the colors in her room (the top was actually a slick white finish already) and switched out the knobs (found at Home Depot). The gold heart I free handed and painted onto the wall in Martha Stuart's gold metallic paint. These little guys I found in the dollar section at Target and spray painted them gold. 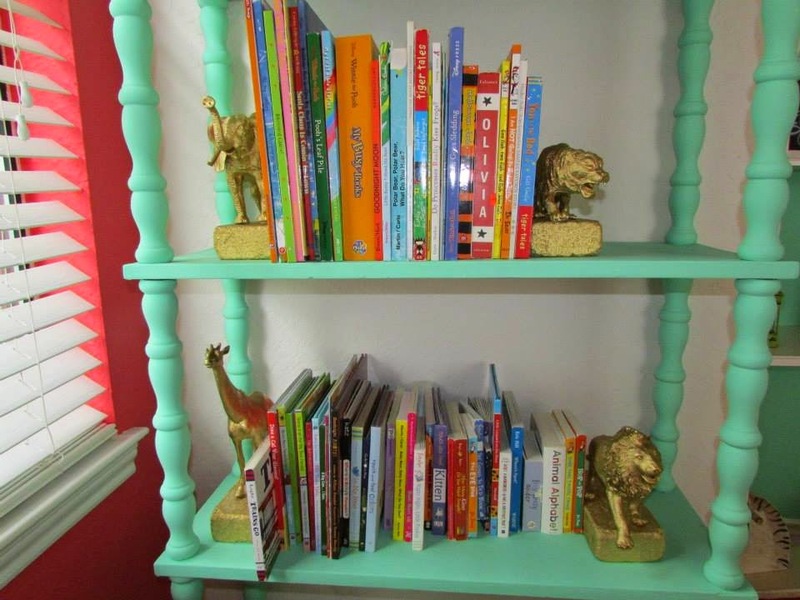 They were originally glued to bricks I also spray painted gold and used as book ends, but when I moved her large bookshelf out of the room I took them off the bricks and moved them up here for decoration, they were too cute to not display. This is Kirby's favorite section of her room. The kitchen is from Ikea as well. If you notice underneath there are three plastic tubs that we purchased from Ikea too, and they contain her play food and tea set/dishes. Her princess houses and farm house are probably the most utilized toys in her room. She brings her little figures over here and plays with them in the houses and cooks for them etc. She is such an imaginative player, I just love watching her play. 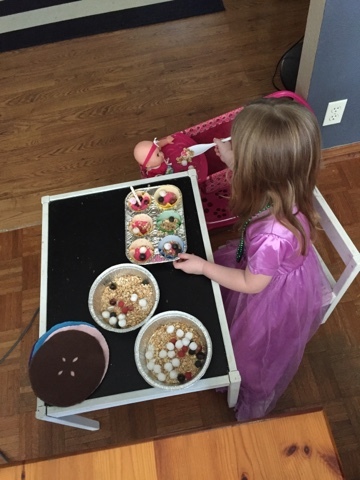 I have definitely "taught" her how to imaginative play by helping her pretend with her little figures, and then she just took to it from there and comes up with the most creative little things, it cracks us up. Sometimes in the evening when Brian and I are chatting she will just go into her room and play and we crack up listening to the things that she talks about. She is such a smart girl & I couldn't love her or her sweet personality more. Her bookshelf is definitely overflowing and we can't really go up a shelf because she can't reach, so I am a little up in the air over what I am going to do about that as well. We will be moving all of the baby books over to Jack's room soon and that will open up some space for her, but for now she is maxed out on books. We go to the library a lot to have variety in our books each week without having to purchase them, so that helps out a lot with the need to add too many more books to her collection for now. The letters spelling her name, were purchased from Hobby Lobby and I mod-podged the different prints of paper onto them (maybe I will post a tutorial on those one day as well). She absolutely adores this bed (from Ikea). It's very low to the ground and has little side rails, so we didn't even have to add bumpers or anything. It is actually an extendable bed. This is the smallest phase of it. We got it to save space, and it was definitely a smart purchase. It comes with two extra pieces that you can connect onto the mattress and then extend the frame as they grow. This little chest is from Ikea as well and it contains all of her stuffed animals. My favorite part about it is that the drawer is on wheels, not tracks, which is perfect for a toddler because lord knows if that thing was on tracks I would be fixing it constantly. The pictures above her bed are hand painted by my dear friend Sarah with The Stationary Bakery. She is amazingly talented and they were a gift to me specifically for Kirby's room and were the basis of what I designed the whole room around. They were positioned better in her original room so I am thinking of designing a fun gallery wall with lots of gold & floral accents based around these pictures since there is a little too much blank space on the wall with the smaller bed. The quilt and sheets are both ordered from Target online. The bright coral and the mint from the trees on the sheets are where I pulled the wall and dresser colors from and the soft grey animal quilt just tied it all together perfectly. 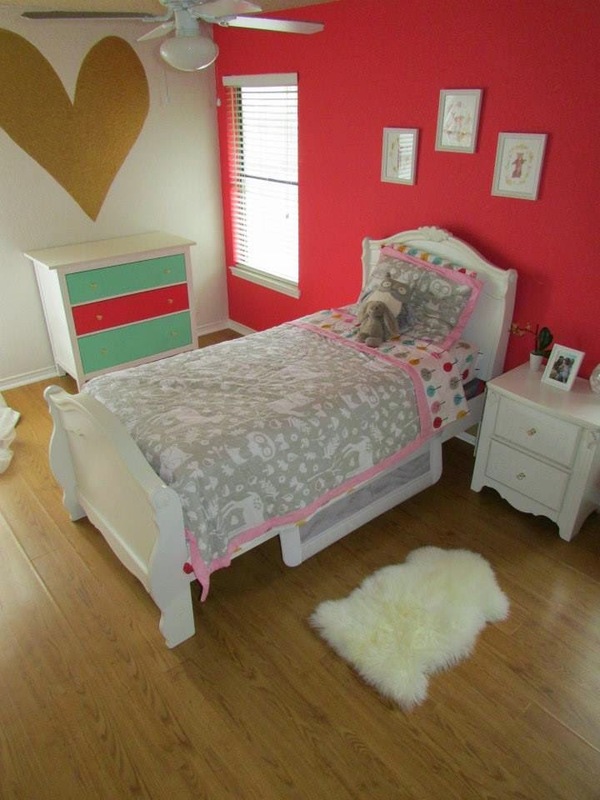 Kirby loves animals, so if there is any theme at all to this room I would say coral & mint with gold and animal accents. Then finally just some bird's eye views so you can get an idea of the whole layout. The little table is from Ikea, I made it over with a little white paint (it was raw wood) and some chalk paint on the top. I also mod-podged some fabric on to the tops of the seats, That was part of her Christmas present the Christmas before last. The rug I found from Home Goods for $50 and I think it tied the room together perfectly and made a perfect space for the table. She slides over one of the chairs each night to act as a night stand and places her water on it, so it worked out perfectly sine there isn't really space for a nightstand with this layout. There you have it, Kirby's toddler room + playroom combo. I hope this gave you some helpful ideas if you are looking to do the same. It can be a daunting task, but I promise once you have it all laid out and a specific spot for everything it makes clutter disappear and it really does stay so much cleaner. Brian & I say all of them time how much we love that this room stays so organized compared to the playroom that just seemed to always be a disaster. If I forgot to mention where I purchased anything feel free to ask in the comments, I tried to do my best as I went.